Field Roast has moved out of our old address and into a new one! We are now located at 1440 Jackson St S in Seattle’s historic International District! Our new building is an old dairy, built in 1925. Over the years it has housed many a food manufacturer, and we are proud to continue the tradition. We love to think about how many people have worked here, making delicious food and how many people across the country (and world?!) have eaten the food made here. This building holds charm, and spirit and we feel it is much better to use existing buildings rather than tearing them all down and building new ones, or leaving them empty and neglected. Part of the Field Roast philosophy is to nurture and nourish and to honor traditions. We feel we have done this with this building, and there is so much vibrant energy flowing through this space we know we made a great decision to move here. The way the interior has been designed means the office and production are connected – something which is rare in foo d manufacturing. We have huge windows that look right into production and all roads flow through the heart of our place, our kitchen! Sharing meals and common space is a huge value of ours – connectivity through food! Thank you to everyone who has made this move possible. We needed a new space because we are producing so much more product to meet demand all across the country. Now with increased production and storage space finding Field Roast in more places is becoming a reality. It is amazing to think of all the people all over preparing and sharing a meal with Field Roast. Thanks for carrying on the tradition with us! 1. 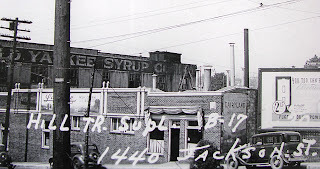 1440 S Jackson St, 1925. Source: Museum of History and Industry. 2. 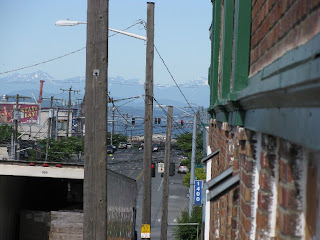 View of the Olympic Mountains looking down Jackson St from our parking lot.